Year 1843 (MDCCCXLIII) was a common year starting on Sunday (link will display the full calendar) of the Gregorian Calendar (or a common year starting on Friday of the 12-day slower Julian calendar). February 6 - The Virginia Minstrels perform the first minstrel show (Bowery Amphitheatre, New York City). February 14 - The event that inspired the song Being for the Benefit of Mr. Kite! is held. March 15 - Victoria, was founded by the Hudson's Bay Company as a trading post and fort. July 19: SS Great Britain launch. May 22 - The first major wagon train headed for the northwest sets out with one thousand pioneers from Elm Grove on the Oregon Trail. May 23 - Chile takes possession of the Strait of Magellan. Ulysses S. Grant graduates from West Point 21st from a class of 39. John J. Peck graduates from West Point 8th from a class of 39. 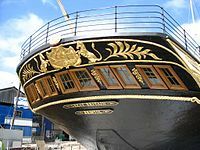 July 19 - The SS Great Britain is launched from Bristol. August 15 - Tivoli Gardens, one of the oldest still intact amusement parks in the world, opened in Copenhagen, Denmark. October 13 - In New York City, Henry Jones and 11 others found B'nai B'rith (the oldest Jewish service organization in the world). November 28 - Ka La Ku'oko'a: Hawaiian Independence Day. The Kingdom of Hawai`i was officially recognized by the United Kingdom and France as an independent nation. December 19 - First publication of Charles Dickens' A Christmas Carol. The world's first commercial Christmas cards are printed by Sir Henry Cole in London. Quaternions are discovered by William Rowan Hamilton. The Economist is first published. Abbeville is founded by descendants of Acadians from Nova Scotia. First publication of Edgar Allan Poe's short story The Tell-Tale Heart. 212 people were married in 1843. There were 0 military battles in 1843. This page uses content from the English language Wikipedia. The original content was at 1843. The list of authors can be seen in the page history. As with this Familypedia wiki, the content of Wikipedia is available under the Creative Commons License.